Poppycock is Trent Pancy, Tuure Pitkänen, Boris Kashentsev and Ulla Oksanen; 4 improvisers based in Tampere who have played together for over 6 years. While they all come from different cultural and professional backgrounds, they are tied together by their love of being playful, fast, and bold on stage. Their performances are a testament to what can happen when friends get together to act like fools. Four friends, together on stage, unrestricted by format, and guided only by their instincts. This structureless improv show follows patterns, themes, and internal inspirations, combining scenes and elements of gameplay together seamlessly with strong characters and interesting relationships. This show can be hilarious, heartwarming, and horrifying, but it is undoubtedly free. 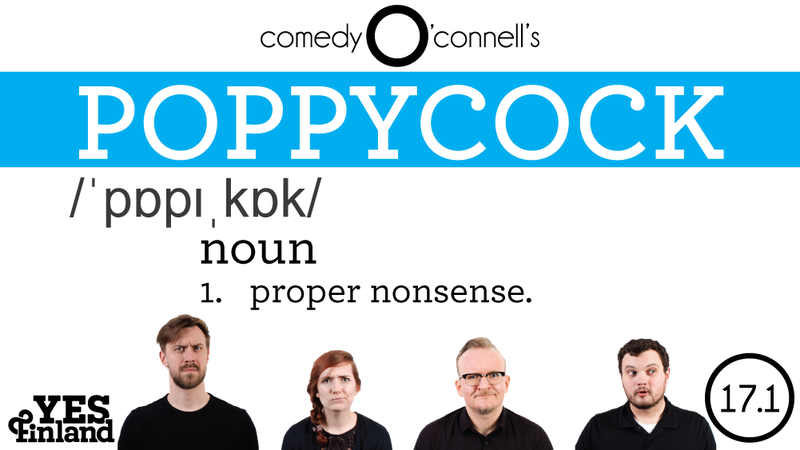 POPPYCOCK performs on the 3rd Thursday of every month at ComedyO’Connell’s at O’Connell’s Irish Bar.